William Hill Sports - Ready For Some Football Action? The NFL is nearing ever closer with less than a month left before current champions Seattle Seahawks travel to Wisconsin to take on the Green Bay Packers. With an influx of exciting youngsters like Jadeveon Clowney, the first pick of the 2014 NFL Draft, of Houstan Texans, Ha Ha Clinton Dix with the Packers while Texas A & M's Johnny Manziel, winner of the 2012 Heisman Trophy, makes his much heralded arrival at the grand ol' stage with the Cleveland Browns. The youngsters are impressive but that is not to say that the old guard are lacking. Peyton Manning proved again last season why he is the greatest quarter-back America has ever produced. You can be certain that the Denver Broncos stalwart will be hoping to avenge his side's Super Bowl loss last year. More incredible than his extraordinary talent is his staying power, Manning is entering his 17th NFL season but has stated that retirement isn't even on his radar. In stark contrast, Tom Brady, another great of the game, had his worst season in five years. He'll need to be at his mercurial best this year if the New England Patriots are going to be in Arizona on February 1st. Therefore the scene is set for hopefully the most explosive NFL season, even without Richard Sherman opening his mouth, but who should you put your money on? Despite a ball yet to be thrown the Seahawks and the Broncos are the join favourites with places like Zebra Casino, with the San Francisco 49ers not far behind. The Pats are fourth favourites in the betting but if Brady continues to be stuck in the mire they have no chance. As witnessed last season, the Seahawks have the best defence in the league and if their defence can be as stringent as they were last season, conceding just 231 points, then they are going to be extremely hard to break down. Attack wise they don't offer much but when you're impervious to opposition attacks lax scoring is not too big a problem. The Broncos are the polar opposite. With Manning's rocket of an arm they managed to amass 606 points, an NFL record, and they will be going even harder this season as they seek retribution. The 49ers pose a threat but, on paper it seems utopian to think of any other Super Bowl final than the Broncos and the Seahawks. This time however, it will be the Broncos and Manning who get their hands on the Vince Lombardi Trophy. 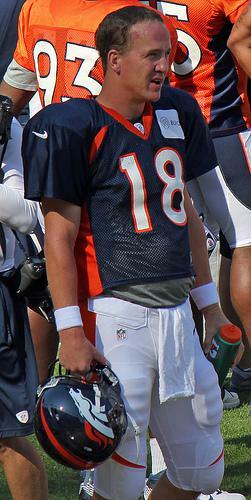 For what must be the 10th consecutive season, Manning is instilled as MVP favourite. But, when you are still breaking records it's hard to see otherwise. Aaron Rogers, the 2011 MVP, is another quarter-back touted but it's hard to see the Green Bay man managing to garner stats greater than those of Manning's, which he'd need if he was hoping to usurp the five time MVP. Calvin Johnson of the Detroit Lions is an outsider. The wide receiver drinks the same water as Manning as they both break records for fun. Johnson isn't blessed with the greatest of sides but a good run with the Lions would pay testament to his quality and certainly solidify his claim for a ring. If, as already predicted, the Broncos win the Bowl then it seems nigh on impossible that anyone bar Manning, injury permitting, will be named the league's most valuable player. The tag of being the first draft pick can be a noose for some players but hopefully that curse will omit Clowney, who, as his reputation suggests, is a good bet to get over five sacks in his maiden season. Manziel, who for a QB doesn't half like to run, is at an attractive price to get over six rushing touchdowns. Michael Sam, the first openly gay player in the NFL, makes for an attractive bet. The St. Louis Rams' Defensive End is currently as far out as sevens to make an appearance for the Missouri outfit this season.